Are you bored with the same meals for dinner every night? 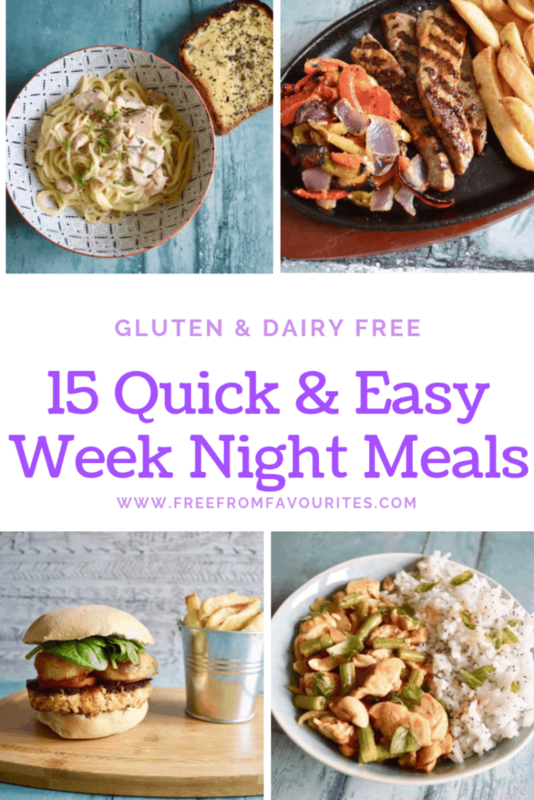 I’ve pulled together a list of gluten and dairy free dinner recipes that are quick and easy to pull together on a busy week night. Most of them are on the table in under 20 minutes. 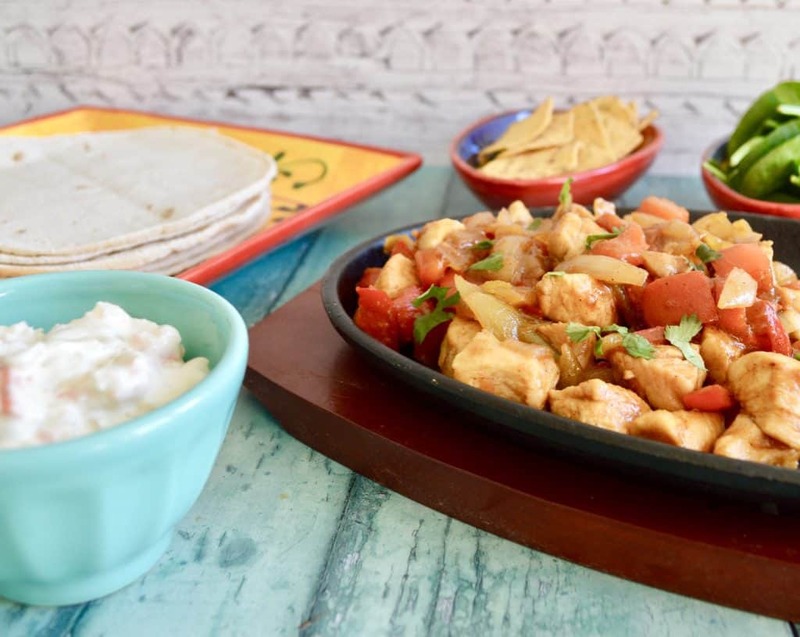 Have a Mexican evening with this lovely spiced chicken with onion and peppers. I’ve served it with some salad, gluten free tortilla wraps, tortilla chips and let people help themselves. 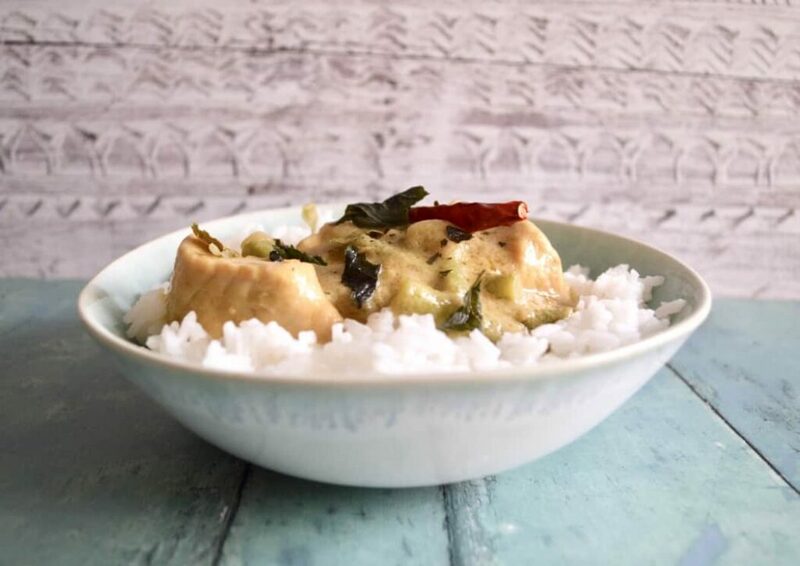 I serve a lot of Thai curries in my house, they are really easy to put together, taste great and best of all a lot of the ingredients used in them are naturally gluten and dairy free. 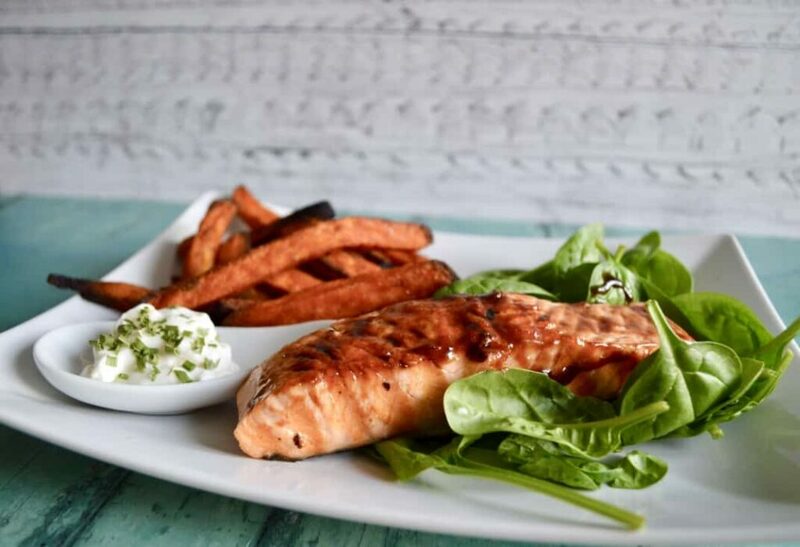 Salmon roasted in a beautiful balsamic glaze and served with sweet potato fries. 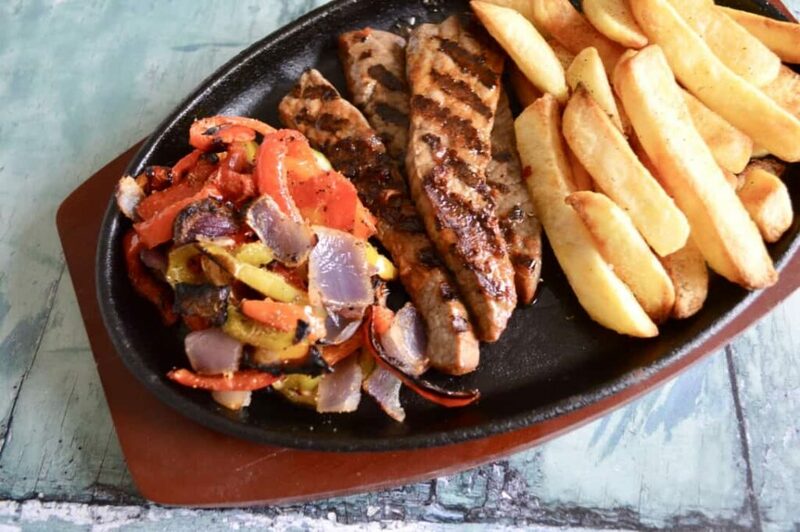 You can make this recipe simpler and quicker by using a shop bought balsamic glaze or preparing the glaze the night before. I love the bright colour of this curry and it is packed full of goodness from the spinach. It is one of my quicker curries to put together but still has a great depth of flavour. Most pasta dishes are quick to prepare including making the sauce from scratch. I think with the majority of my recipes you can make the sauce in the time it takes to cook the pasta. 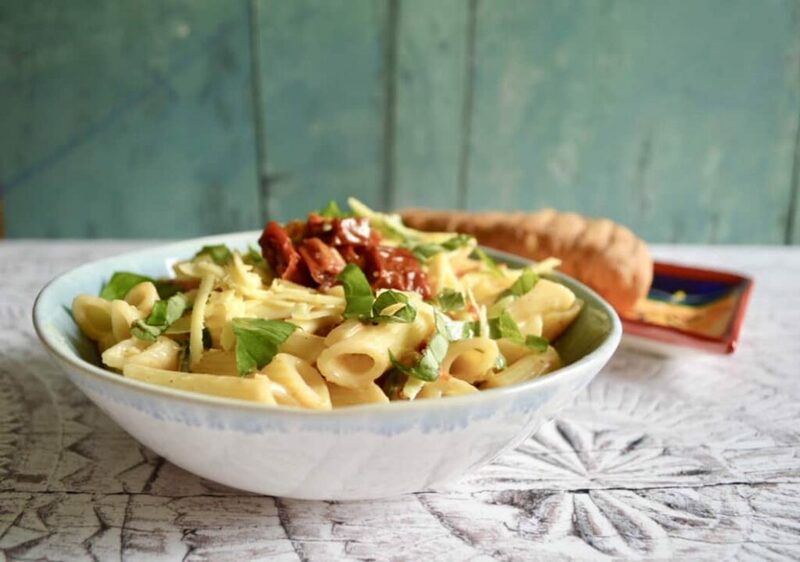 This dish has a lovely dairy free creamy sauce with sundried tomatoes. 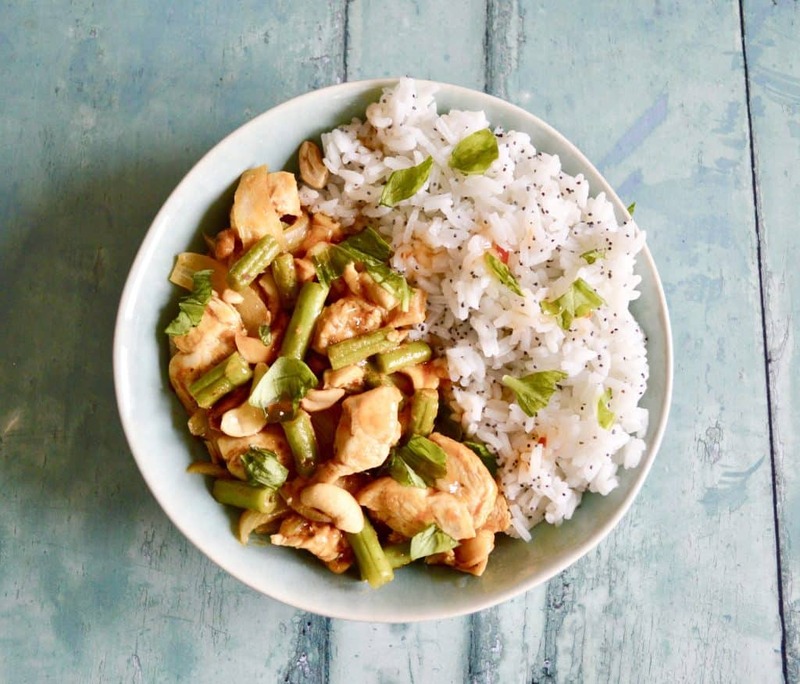 This recipe is a bit like a cross between a Thai curry and a stir fry – not sure how well that sells it! Anyway it tastes amazing but don’t worry if you can’t get Thai Basil just use ordinary basil and most people won’t know the difference. Rather than the normal beef burgers try something a bit different for dinner. The salmon burgers can be prepared the night before to save a bit of time. That way when you come home from work you just need to cook the salmon burgers and prepare the sides. Rather than making this chicken korma from scratch I’ve cheated a bit and have used a korma paste. 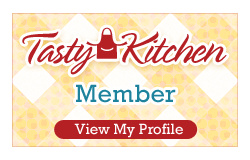 This makes a really quick and easy but very tasty korma and a lot of curry pastes are naturally gluten and dairy free as well. 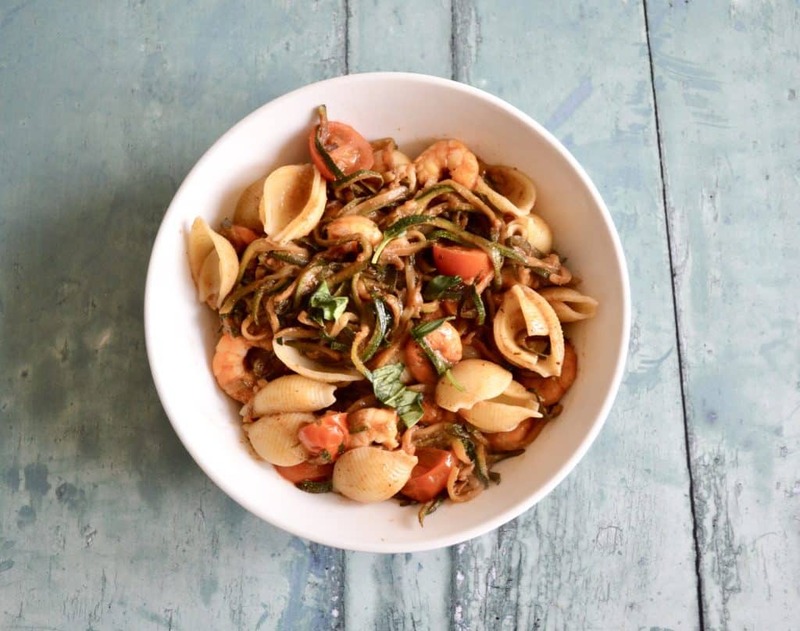 Prawns, courgette noodles and tomatoes are served with pasta shells in a light, lemon sauce. When I go out for Thai food I always gravitate towards dishes that have cashew nuts in them – I love them in savoury dishes. 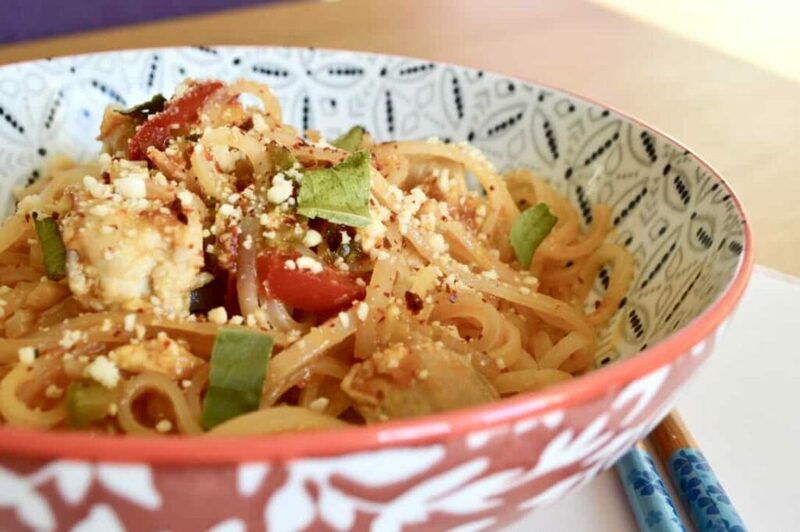 Rice noodles are naturally gluten free so are a great base for Thai dishes. Tender beef strips are coated in a simple honey and sriracha glaze then seared in a hot pan. I served mine with roasted vegetables and fries. 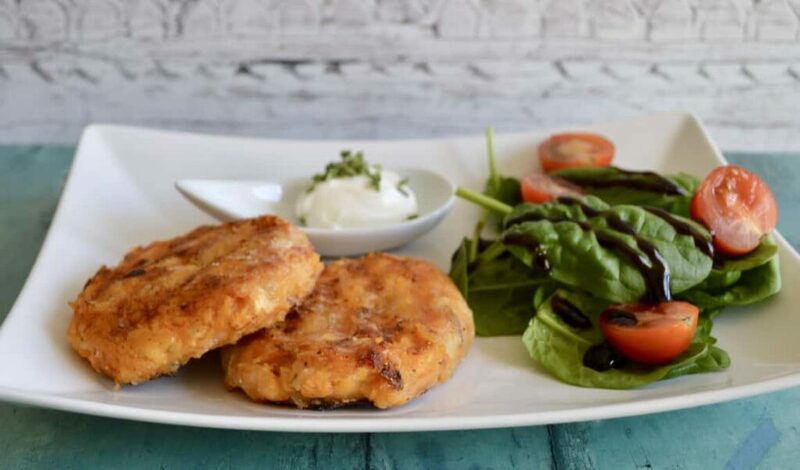 You can make these sweet potato chilli salmon patties in advance, they store in the fridge overnight or you can put them in the freezer. They are a little like a fishcakes but without the breadcrumb coating. 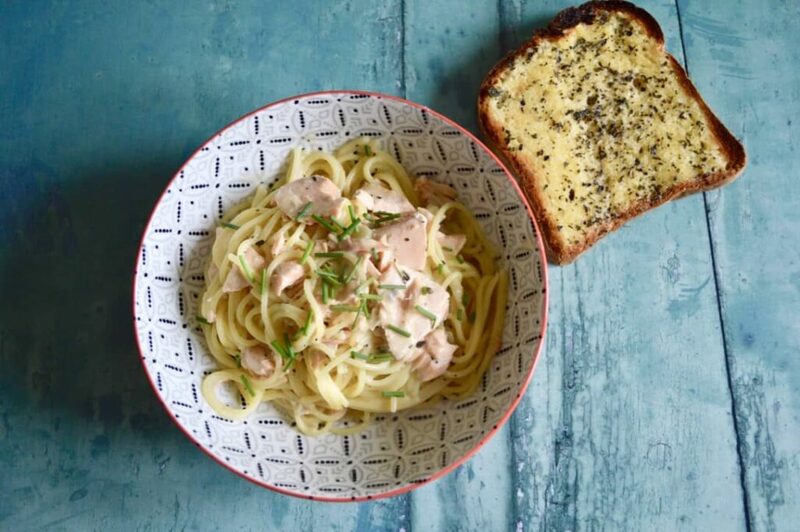 Flaked salmon served in a delicious creamy sauce over spaghetti. I’ve also made my own gluten and dairy free garlic bread to serve as a side dish with the spaghetti. One of my favourite pasta dishes, I love Marks & Spencer smoked chicken sausages. 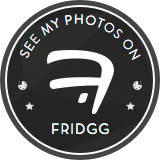 They make a great addition to dishes like this and are also naturally gluten free. If you are looking to increase your vegetable intake for the day then try this chilli vegetable stir fry. 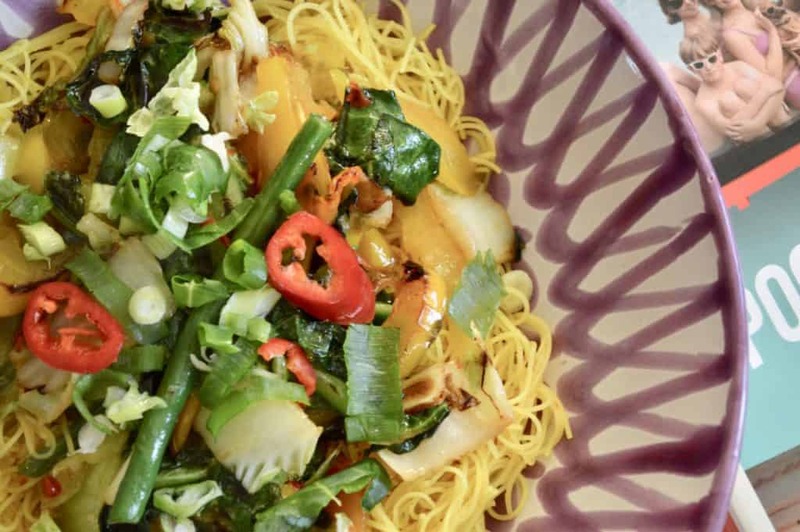 Lots of vegetables with a sweet chilli sauce served on a bed of rice noodles.